BERKLEY, Mass., Sept. 4, 2013 – Duke Energy Renewables, Integrys Solar, Canadian Solar Inc., and Community Energy Solar today announced the completion of a 3-megawatt (MW) AC solar power project in Berkley, Mass. 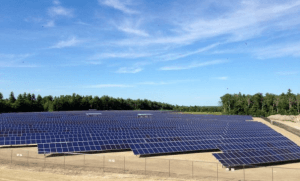 The Berkley East Solar Power Project is co-owned by Canadian Solar and INDU Solar Holdings – a joint venture between subsidiaries of Duke Energy and of Integrys Energy Services. groSolar is an industry-leading large commercial- and utility-scale solar engineering, procurement, and construction firm serving the 1 to 30 MW market, and is dedicated to high quality, on time, and on budget project performance. With megawatt+ projects and over 2,000 installations nationwide, groSolar’s experience spans a broad spectrum of applications. These include design and build applications atop brownfields/landfills, commercial, educational, municipal facilities, and manufacturing plants. groSolar provides a one stop source for all your solar project needs including ongoing operations and maintenance. Additionally, groSolar’s distribution channel offers product procurement and logistics services to approximately 1,500 solar installers and contractors across the nation whose focus is on residential and small- to mid-scale commercial solar applications.